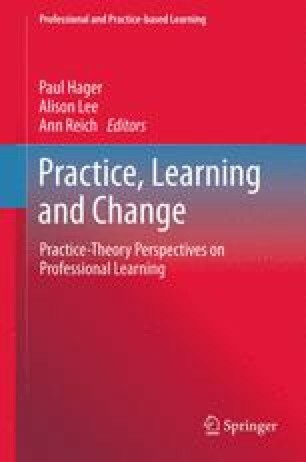 Focusing on the experiences of one 95-year-old patient, Jane Edna, this chapter uses a practice theory approach to investigate in situ ‘knowing-in-practice’ (Gherardi, Situated knowledge and situated action: what do practice-based studies promise? In Barry D, Hansen H (eds) The Sage handbook of new approaches in management and organization. Sage, Los Angeles, pp 516–525, 370, 2009b) in emergency health care. In particular, we discuss relationships between work, knowledge/knowing and learning through an examination of professional and interprofessional ‘doings and sayings’ (Schatzki, Organ Stud 27(12):1863–1873, 2006) by clinicians around the bedside of Jane Edna, who spends over 11 h in a busy Australian hospital emergency department (ED). We present and explore some of the ethnographic and spoken interactional data recorded between Jane Edna and her team of clinicians. We are primarily concerned with the practices and the potential for learning practices that the ED affords the junior doctor who directs Jane Edna’s care. The junior doctor’s ‘doings’, ‘sayings’ and ‘beings’ concentrate on applying biomedical scientific knowledge – practising medicine learned in vacuo – privileged within the institutional order (Sarangi and Roberts (eds), Talk, work and institutional order: discourse in medical, mediation and management settings. Mouton de Gruyter, Berlin/New York, 1999) of the ED. We consider the interplay and consequences of differentially valued epistemologies (Cook and Brown, Organ Sci 10(4):381–400, 1999), in particular, the dominance of ‘organisational knowledge’ (knowledge possessed by individuals – here, high-status doctors). We discuss how ‘organisational knowing’ (the collective working/knowing of all the participants who care for Jane Edna including Jane Edna herself) and ‘knowing-in-practice’ (Gherardi, Learn Organ 16(5):352–359, 2009a) could be more explicitly foregrounded to help create the team-based models of care that are enshrined in twenty-first-century hospital policies. The chapter concludes with some implications for understanding practice and learning practice in organisations as doing knowledge together where knowledge is emergent and co-constructed in situ through language, actions, relationships and material arrangements.